Before we begin the search process, we capture the best-fit requirements, familiarize ourselves with your firm and industry, conduct comprehensive interviews in your offices with appropriate staff, assess the organizational culture, define the target position you wish to fill, and evaluate the relationship elements of management and peers. We create a written candidate profile of the ideal candidate and position requirements including basic function, relationships, responsibilities and authority. We work with you to approve this profile and leverage these specifications to describe the position to prospective candidates. Because we are not a placement firm, we do not solicit and file resumes from job seekers. We proactively search for candidates only when our client initiates a search. We conduct a targeted search based on client requirements, identify a pool of prospective candidates through proven direct sourcing methods, and personally screen all candidates before you meet any of them. We know your time is valuable, so we present only those applicants with the qualifications you are seeking. We spend a minimum of four hours with each candidate before we present anyone including a two-hour phone interview followed by at least two hours of face-to-face competency interviewing. We then provide an executive summary or complete assessment of these interviews to you. We typically present formal profiles of three to four candidates and schedule interviews based on your feedback. Some clients also request thorough, formalized computer assessment reports backed by proven organizational psychologists to confidentially capture candidate competencies from another prospective; we provide this option as well. It is critical to run background and reference checks on finalists for every position. We pursue detailed professional and personal assessments by former supervisors, peers, subordinates and other associates. We also completely verify work history, education and other work related measures. However, we do not make any inquiries that would jeopardize an individual’s current employment. We also follow the standards outlined in the Fair Credit Reporting Act as it affects hiring decisions in the United States. We are available to assist with the offer agreement, or employment contract, and to facilitate negotiations within your guidelines. On acceptance of the offer, we remain in close contact with you and the candidate during the resignation phase and during relocation, if applicable. Our Signature Search Process does not end with offer acceptance. We remain in contact with you and the newly hired executive to help identify and solve any issues that may arise. We will often visit with the new hire early in the orientation phase and then follow up by phone and mail as the executive settles into the new work environment. We will connect with you and your hired executive for many years…as long as they are on your team. This involvement allows us to advise you on how well the new person is adjusting. By developing our own 7-step Signature Search Process focused on service and detail, we’ve added a level of commitment to the tradition of retained search that promises to unearth talent that lasts. Today’s companies need to know that they are spending their time and money well. Our Signature Search Process is a proven method for “unearthing talent that lasts” and ensures you only talk with the best available candidates for your open position. Because we dig deep into the marketplace to find the best candidates – even those who may not be actively looking for a job – we will find you specialized candidates within a specific industry. We thrive on identifying the buried warrior who is unique to your hiring needs. 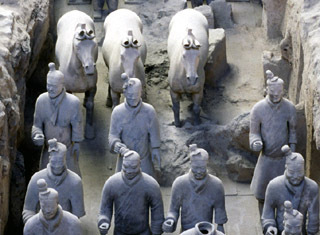 Thousands of these soldiers were unearthed in 1974, each with unique qualities and characteristics. DF Brown & Associates, Inc. seeks unique qualifications and experience to present to our clients.